(Newser) – A 4-year-old Virginia girl given months to live in September held on for one final Christmas before passing away Tuesday, reports WTVR. But thanks to friends, neighbors, and complete strangers, Virginia Rose Vandermark had a magical Christmas before Dec. 25 hit. 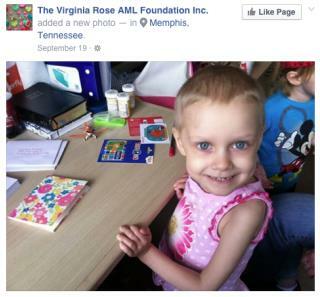 According to ABC News, Virginia was diagnosed with acute myeloid leukemia in April. "With her little body failing … it would not be expected she would make it to Christmas this year," Virginia Rose's father Jonathan Vandermark tells WTVR. And so the family had been trying to celebrate Christmas for her every weekend, with a big celebration being held earlier this month. "We have a no crying in front of Virginia rule," Vandermark says of that night. It "was a hard night to keep that rule." How could anyone say there is anything good about a deity who would give leukemia to a 4-year-old?